Unsurprisingly, expectations were high. The 2008 Cloverfield is a 5-star 9/11 allegory that dazzles a decade later. 2016’s 10 Cloverfield Lane, itself surprise announced with a trailer one month before release, was an excellent sci-fi chamber piece about current apocalypse anxieties. The Cloverfield Paradox shares similarities with the second movie. Both started life as non-Cloverfield scripts heavily rewritten to enter the Clover-fold. 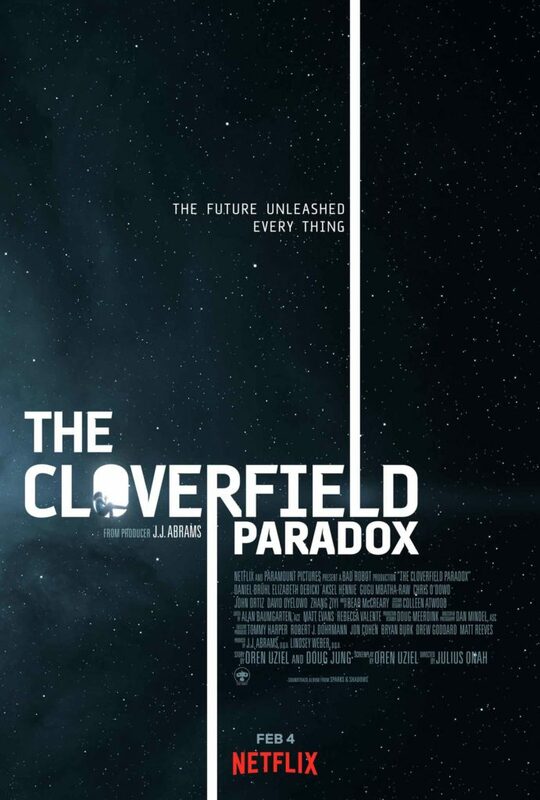 10 Cloverfield Lane was The Cellar and The Cloverfield Paradox began life as God Particle. Movie #3 is also something of a chamber piece, the action largely confined to a capacious space station. But sadly, this new chapter falls short of the first two instalments. They were smart commentaries on modern fears, wrapped in thrilling sci-fi packaging. The Cloverfield Paradox is a blunter tool. Belle star Mbatha-Raw is Hamilton, a scientist embarking on a multi-year space mission that could solve Earth’s energy crises and avert World War III. Hamilton leaves husband Michael (Davies) at home, their relationship strained after the death of their children. As the experiment repeatedly fails, tensions run high among the mixed nationalities crew. Technician Volkov (Hennie) blames head scientist Schmidt (Brühl) for botching the job and paranoia spreads. On Earth, opponents to the mission warn of The Cloverfield Paradox. Mission success could tear the fabric of reality and unleash other-dimensional beings across different time periods. Then the crew successfully test the particle accelerator. For all the talk of Oren Uziel’s reworked God Particle script, this resembles little more than a Cloverfield-ification of the Jake Gyllenhaal starring Life or Danny Boyle’s Sunshine. Or even C-level fare Event Horizon, Pandorum or Supernova. Plot twists are as fresh as the recycled air the crew inhale. Cutaways to Earth-based mayhem undercut the claustrophobia simply to stick in now expected monster mashes. A quality cast lend a pedigree the film does not warrant. Mbatha-Raw enthusiastically grabs the lead role, Zhang Ziyi makes a welcome return to English language movies after 2009’s disastrous Horsemen and Chris O’Dowd is on hand (literally) for comic relief. But, The Night Manager’s Elizabeth Debicki appears to have been told her character is an android and David Oyelowo is simply wasted. Besides making this a sequel/prequel to previous Cloverfield movies, the reality melting concept is never imaginatively explored. Arresting moments aside – a crew member fused into the wiring of the space station, squirmy worm business – nothing takes advantage of the idea that anything can happen. When a major dramatic arc rests on reuniting a family rather than say, saving humanity, the level of ambition is apparent. Sophomore feature director Onah doesn’t demonstrate much affinity with sci-fi tales, explaining the anonymous efficiency with which this is bolted together. Paramount reportedly made $50m from the sale to Netflix, a canny move as this is straight-to-rental fodder. But, it has generated excitement for the home Ent service (whose marketing costs were “merely” $5m on a Super Bowl ad). Apparently, future instalments will be theatrical releases again, suggesting the studio has better scripts to rework than the one here.